Blogger Meg Wolfe of Minimalist Woman was kind enough to offer me a free review copy of her new ebook Minimalist Cooking, so I took it. I’m not just a minimalist, I’m a frugal minimalist. I promised her I would mention the ebook here whether I liked it or not — but I told her I would spend a little more time on it if turned out to be good. She’s only asking $4.95 for Minimalist Cooking. 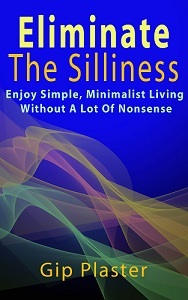 It includes 27 recipes and some good text about minimalism in the kitchen. It’s a nicely designed and useful book. The book is worth the $5 for the six pages of text about Meg’s journey with cooking and reducing the clutter in the kitchen. It’s also worth a fiver to see the beautiful — real! — photos of the beautiful real food she’s prepared. I can’t offer a full review because I’ve only had the book a few days and I haven’t prepared any of the recipes, but I can make a few comments. If you like eggs, you probably already know how to make a frittata. And if you know what hoppin’ john is, you probably already know how to make it. You can probably guess what’s in the potato-sausage skillet supper she presents, too. But you probably haven’t made a good Caribbean chicken chili lately, and she includes a recipe for that. There’s a nice multi-purpose no-knead bread recipe, too. I don’t think there’s anything minimalist about turning on an oven when it’s over 90 degrees outside, so I’m immediately turned off by recipes that start with preheating an oven. Those might get my attention once the frost comes — and they might get yours if you have much milder weather than here in Texas. Heating a metal box inside my home to hundreds of degrees while asking another machine to keep the air outside it at around 75 degrees just doesn’t make minimalist sense to me. Finally, you have to respect anyone who suggests “kicking the marketer out of the kitchen and letting the cook back in” as the tagline of Meg’s ebook suggests. A simple, deliberate life has no place for complex systems of any kind — and certainly not in a place like a kitchen. It’s a place that should be filled with the simple pleasures of a simple life. Meg gets that and shares it in Minimalist Cooking. I hope you get it, too. I’ve been a minimalist cook for years. I cannot understand why someone would want to spend hours cooking a meal when there is so much technology available to make your life simpler. True, a nicely presented meal tastes great if the eyes are involved but I prefer to cook quickly, simply and for taste. I try to turn out a meal from preparation to serving within an hour. The oven takes a huge amount of electricity to heat for a short period of time and as you say why heat the house further in an already hot environment. makes much more sense to do this in winter. I prefer using a steamer or skillet than an oven. Simple meal, quick preparation and great taste is my recipe for satisfaction. Thanks for commenting. Meg mentions in her ebook that restauant meals are nice, but there’s no reason to try to create them at home unless cooking is your hobby. I do enjoy making a new recipe now and then, but I usually try to spend no more than 20 to 30 minutes cooking a meal. A Crock-Pot is my only convenience appliance, and I go through phases where I use it weekly. My oven hasn’t been on since April, and it probably won’t be on anytime soon. This winter, it might see some use two or three times a week.